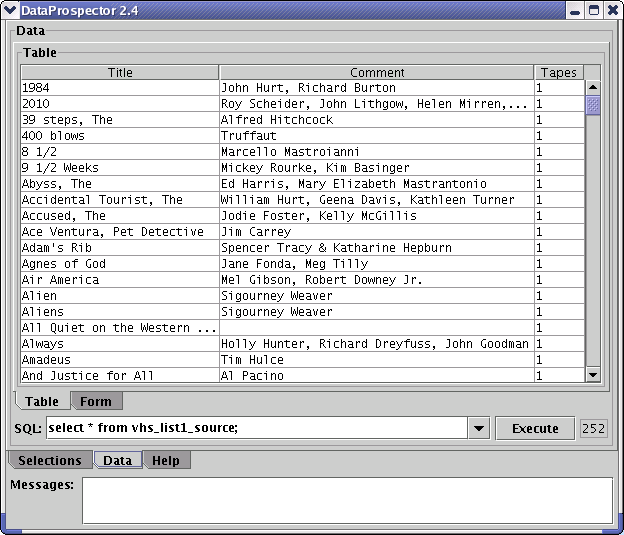 DataProspector is a database client program that is designed to be very easy to use. Create, transfer, and process databases. Work with database tables, including those with multi-line fields. Interface with many other programs intuitively, using the system clipboard. Learn database technology using a slick, easy-to-use program. DataProspector takes advantage of some of the newer features of Java to create a more powerful database client. DataProspector relies on the presence of the MySQL database engine (preferred), or the PostgreSQL engine, and an appropriate JDBC driver for your chosen engine. If you are using a newer version of Linux, you are most likely 90% ready to use this program. Because DataProspector is written in Java, it will run on virtually any computer you can name — any computer for which there is a version of the Java 1.4 runtime engine. Oh, I almost forgot the other good news. DataProspector is CareWare — that means no money, now or ever. You just have to care. Version 3.1 10/13/2004. Fixed a bug that produced the dreaded NULL for undefined fields in new records. Version 3.0 03/22/2003. Improved the error handling to control an out-of-memory error on a very large query result set, optimized the query result handler code. Version 2.9 03/21/2003. Overhauled the record and field parsing code, in particular to improve handling of clipboard content. Version 2.8 03/20/2003. Fixed a clipboard problem that prevented proper behavior in Windows. Version 2.7 03/19/2003. Added column auto-width so table columns automatically adjust to the size of the displayed data. Version 2.6 03/14/2003. Caught a couple of untrapped error conditions that might prevent a smooth startup. Version 2.5 03/11/2003. Added an error logging window and improved the SQL command set for PostgreSQL (it now lists databases properly). Version 2.4 03/10/2003. Added a method to automatically enclose column names in back-ticks if MySQl is the database engine in use. This allows the use of nearly anything for a column name and simplifies the import of data from other applications. Updated the documentation to reflect this change. Version 2.3 03/10/2003. Updated the documentation to reflect some common issues with importing spreadsheet tables. Version 2.2 03/09/2003. Added code to underscore spaces in spreadsheet column titles to avoid a rather obvious SQL error when they are converted to a database table. Version 2.1 03/09/2003. Initial public release. Windows users: Download the Windows install package DataProspector.exe (287 KB) . Download and install the Java 1.4 Runtime Engine appropriate for your computer. Download and install one of the available JDBC drivers. If you are using MySQL, get one here . Detailed installation instructions are provided with DataProspector — it even locates and lists the appropriate Java installation directory in its help display. Just download your choice of package, install it, then acquire the Java 1.4 or better runtime engine, install it, and run DataProspector. Click "Help" for use instructions. On a related topic, and to examine another approach to database access, see my PHP Pages. They are lightweight, PHP server-side Web pages that do nearly as much as DataProspector does.